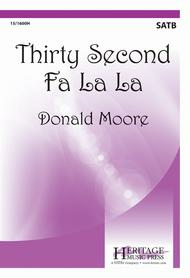 Thirty Second Fa La La composed by Donald Moore. For SATB choir (a cappella). General, Secular Christmas. Octavo. Published by Heritage Music Press (LO.15-1600H).Yes, it only takes thirty seconds to perform this unique and tasty "Fa La La!" Creative programming at its best, this piece can also be utilized as an effective warm-up exercise and is a terrific vehicle for teaching chord building, independence of parts, and dynamic contrasts, as well as being an introduction to imitative style and a cappella singing.